Designed specifically to work with our Elfa Easy Hang Top Tracks, our Drywall & Plaster Anchors allow you to install your shelving just like a professional. For drywall, plaster and paneling from 3/8" to 1"
Use our exclusive Elfa Utility Track with our assortment of Elfa Utility Hooks to organize your garage, mudroom, utility room, laundry or pantry. It can be mounted directly to a wall or used in conjunction with Elfa Standards or Elfa freestanding Uprights. Elfa Drywall & Plaster Anchors is rated 4.1 out of 5 by 37. Rated 4 out of 5 by Hollygil from Elfa Custom Closet I was able to use some pieces I had from a former installation and buy a few more to install a new master closet. The build quality is very good with Elfa, though you definitely pay for it. And the flexibility to change the design is pretty limitless; I actually changed the closet design once I got pieces home and was able to easily return the pieces I didn’t need. But my favorite part was Contianer Store’s excellent customer service. At least at my store (Northbrook, IL), the staff is also super knowledgeable, efficient, and professional. Rated 4 out of 5 by Kokes from Seems sturdy but takes a lot of turn to "set" The anchor is easy to use, and seems to be holding up the shelves well. Top track is on the wall, solid and sturdy. I used 3/8 bit as instructed. Some holes were tight, but with a bit of hammering, the anchor goes in nice and tight. At first, I stopped screwing it in when it didn't seem to catch. It just kept turning and turning. But after reading the reviews, I went back and continued to screw it in. Good lord it took really long, but it finally started to tighten. I stopped turning when the screwdriver started to lose grip. Overall great product but can be a pain if you are doing it by hand. 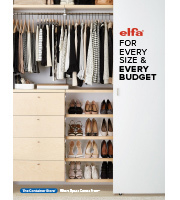 Rated 5 out of 5 by NeatFreakMom from elfa Products We used the elfa Drywall and Plaster Archors installing our own Platinum elfa closet shelving system. They were easy to use and worked great. The system has been up and in use for weeks and no problems. We liked the elfa system so much we are buying another one in a couple months for our next project. Rated 1 out of 5 by Emijane from Unreliable at best These Elfa drywall screws didn't work on 3 out of 4 of my Elfa closet systems. The last closet I've done - the hanging standard simply popped right off the wall. I did 3/8" holes per specs. I was able to use 3M drill-less heavy weight drywall screws instead, thank goodness those are simple to install! Rated 1 out of 5 by Argyle10 from Shredded Simply awful. I bought them because they are marketed as drywall and plaster anchors. I have an older house with plaster walls in the garage. Using the smallest drill bit possible (without needing to hammer so hard you crush the anchor) resulted in holes that were too big. I hung an 80" elfa rack (which I love) and out of 10 holes, nine of these anchors spun. We tested our first item and the entire rack literally fell off the wall. Straight out of a Tim Allen Home Improvement episode. The bike rack did the exact same thing. The resulting 10 holes in my garage look like the remnants of a western movie shootout. Switched to something much less expensive from a big box hardware store and they worked! No spinning, strong hold. Will not use again. Rated 1 out of 5 by ElfaAddict321 from My worst fears came true I purchased this product even after reading a few of the negative reviews about how fragile the plastic anchors are and how giant the holes have to be. Turns out, they were definitely right. 3/8 drill bit wasn't big enough, so we tried to round the holes out a little more. Worked for a couple holes, but the last hole ended up being too big and the screw spun freely. We destroyed several of the plastic achors by testing to see if the holes were finally big enough. Now I am afraid to try backing them all out to fix the final hole that needs to be redone. The worst part was how fragile the achors were. Even with soft drywall and gentle tapping, they would not go in without breaking and twisting too soon. Not a quality product. Now we have an unfinished project, lots of big holes in the wall, and we will need to look for a different set of plastic anchors from another company. If we ever needed to paint this room, we would probably have to redo the shelf completely because the achors won't withstand backing the screws out and screwing them back in again. Once this shelf is up, it better be up forever. Very disappointing. Rated 5 out of 5 by SuzNews from Order online and pickup Because I needed so many of this item I didn't want to make 2 trips during a move. Ordered and picked up 2 days later - Perfect! Rated 1 out of 5 by WorkAtHomeMom99 from Not easy to install Bought these to go with my Elfa office solution, which I love, but they were not easy to use - my wall is drywall to brick. Ended up going to the hardware store and getting a different anchor. Rated 5 out of 5 by 1csj from Best Invention! Holy cow! Where the heck have I been? Where the heck have these wall anchors been? This product made the job super simple! So, you drill the hole in the wall using the small drill bit. If it hit a stud, great, you are good. If it didn't, use these wall anchors, and feel just as secure and confidant about the job! Amazing! you WILL use these for other projects -whether Container Store related, or not! If I can do it - ANYONE can! Container Store is my new favorite place to shop! Rated 5 out of 5 by lindyhopperj from Work so far These were pretty easy to install once we got the hole size large enough. I'd never seen an anchor like this before--very unique design. So far, the shelf seems to be holding up well. Time will tell how well the anchors hold. One thing that was curious was that after tightening to a certain point, the screw just appeared to spin freely after that. The top track seemed like it was well secured, though. Maybe that's just the nature of the design. Rated 4 out of 5 by FamilyOfFour from Good quality anchors Overall, these are worth the price just knowing that you have them when you go to do this project. Good quality. Rated 5 out of 5 by OrganizationByVal from Drywall screws These worked great because the installer used them with no problem. I recommend using Container store's installation service because they are experienced and have the right equipment to install the Elfa systems. Rated 5 out of 5 by CarpMaster2 from Quality and good engineering I have installed several brands of shelving/closet systems over the past several years. Elfa is by far the best, especially for a nice, finished look. The quality of the materials and excellent quality control make the installation smooth and straightforward. The Container Store staff is second to none! Their knowledge and expertise is demonstrated from the design to packaging the products after checkout. They are always so patient with us when entering and editing a design! Rated 1 out of 5 by rcoryw from Terrible Product I have used every kind of drywall anchor available and never found one so difficult to use/install. I tried several times to get this unit to "set" and eventually it broke and I reverted back to standard toggle bolt anchors. Rated 5 out of 5 by shelbo from elfa drywall & plaster anchors I have used elfa drywall and plaster anchors before and find they are strong, reliable and easy to install. I would recommend these to anyone looking for a strong and secure way of hanging shelves. Enjoy!!! Rated 5 out of 5 by McLean from Love these anchors! The Elfa Drywall & Plaster Anchors are an exceptional product. They work wonderfully in an Elfa system, of course, but we have also used them for a variety of other projects -- such as hanging curtain rods. We keep several on hand and are always glad that we do. Rated 5 out of 5 by mrueschman from Solid Anchors As an aspiring DIYer, I have found these drywall/plaster anchors to be extremely helpful and easy to use in my elfa installations and other non-elfa projects. The installation is straightforward enough and they seem to provide a great foothold in the wall. Rated 1 out of 5 by Will3 from Very difficult to install. 3/8 bit too small. Broke all five trying to hammer in despite trying to enlargen hole. 10mm is needed I guess. Very frustrating. Rated 4 out of 5 by dbak94 from Seriously heavy duty drywall anchors I installed some fixed elfa standards for shelves with some of these anchors. I filled the shelves with heavy reference books and, they held up perfectly. The only problem I had with these anchors was when I tried removing them - some of them would absolutely not come out of my plaster walls. Rated 5 out of 5 by windprince from Sturdiest anchors I have EVER used These things could probably hold a tank to the wall. They are VERY well designed and work perfectly! Rated 5 out of 5 by WeDIY from Good hardware for the job Have installed 6 Elfa systems and count on the mounting hardware to be solid. These anchors really do the job. Highly recommend following the directions, having correct drill bit size and a good power drill/driver. I set the drill driver tension to "3" (low) on my Dewalt cordless driver to avoid over-tightening or stripping the anchor. Rated 4 out of 5 by ankurbs from Good anchors with one flaw We just bought our first elfa system for our nursery and I consider myself a do-it-your self type of person, so I was confident I could handle installing this entire system after reading all the directions and watching all the videos. Measuring the location of the holes was easy enough and drilling the holes a bit larger did make getting these anchors into the walls much easier as I did feel hammering them into the wall would break them, however, when it came time to tightening them up, that is where the trouble started. The directions say to use a power screw driver for 20 seconds and it should start getting tight. For the first one, it did, however, as I did the next 6, i could barely get 10 seconds in when the anchor and bolt would start popping out of the hole. it was almost like the bolt was not catching in the anchor even though i initially started tightening the anchor with a hand screw driver. in just about every case, I had to hand tighten all 6 of the remaining anchors. These anchors do work and i am very confident they will hold up my system quite well, but I have never had such a difficult time getting the bolt started and finished. Rated 5 out of 5 by CoffeeAndElfa from Great sheetrock anchors I became acquainted with the elfa drywall anchors when I installed elfa shelving in our home office. They work so well that now I use the elfa anchors whenever I need a good anchor to be used in a sheetrock wall for any purpose. Don't waste time with the cylindrical metal wall anchors that you can get in a hardware store, just use these elfa wall anchors instead. They are much less likely to turn and damage the sheetrock when you are 'setting' the anchor. Rated 5 out of 5 by jopritch from Do Their Job Well These do their job as described. They seem to be a very solid hold, and were easy to install. Rated 5 out of 5 by SusyQ from Great Anchors I have thick plaster with drywall on top, and usually have trouble mounting things. These were a breeze to install and don't even appear to budge! A great, solid product! Leave the mollies at the hardware store. Can you tell me what the material construction of these anchors is? Looks like plastic but just want to make sure rubber/latex free as I have a latex allergy. Thanks! How do you remove these from the wall? I am moving and need to remove and patch. Wondering the easiest way to remove these? I've moved 6 times in the past decade with elfa systems in every locale. Here's what has worked best for me: 1. With a pair of needle-nosed pliers, grab onto any part of the anchor's collar. You may need to work the end of the pliers against the wall to get a grip. 2. Pull and twist until that part of the collar snaps. 3. Repeat 2-3 more times along other parts of the collar. It'll look like a scraggly mess and the collar will be fragmented into 3-4 parts. 4. Push the collar fragments all together into the center and push them through the hole into the wall. 5. Patch and paint. Good luck! Do these need to be screwed into studs? I have plaster walls in a 14 story high rise building. There aren't any wood studs in the walls. Will the plaster be sufficient to hold things safely? These are specifically designed to be used on wallboard (sheetrock) and plaster walls. Can the screw be screwed in &amp; out of anchor multiple times once anchor is set &amp; tightened or is this like toggle bolt where u can only screw in once? I am wondering about what would need to be done if I happened to strip one of the screws, for example the fourth of five screws I will be using, and needed to remove that anchor and install a new one. In that case I would need to remove the three previously installed screws to have access to the fourth screw that I messed up on. These molly screws seem to allow screwing in and out multiple times. Past molly screws I've used did not allow that flexibility. After writing my review, I unscrewed three of the screws and tried to tap in the spacer, but the spacer would not fit into the cap on the end of the molly screw. I notice the spacer is not mentioned in the online demos. I can see how the spacers would make for a tighter fit. I need a different length screw. What are the specifications of the screw? The screw of our elfa Drywall &amp; Plaster Anchor measures 3/16&quot; x 2&quot;. How much weight is each screw and anchor rated for? Weight capacity can be affected by many things like wall construction, the items stored, &amp; the installation process itself. Therefore, we do not have a published weight capacity of any one elfa product. When installed properly and used with the elfa system of hardware, hang standards, brackets &amp; shelves, it will support a considerable amount of evenly distributed weight such as an entire library of books, a complete entertainment system, a pantry full of food, or a playroom full of toys &amp; games. For a more detailed answer to your question, please give us a call at 800-733-3532 so we can help you evaluate what your particular storage needs &amp; location might necessitate.